Scientists call astaxantin ‘the Queen of Carotenoids’. It belongs to this group of compounds acts more strongly than carrot beta-carotene, or lycopene from tomatoes. In contrast to vitamin A, it is not sensitive to oxidation. 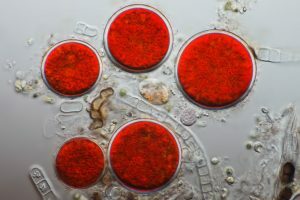 The unique structure of the astaxanthin molecule and solubility in lipids allows its deep penetration into the epidermis and localization in the cell so that it effectively protects it from the harmful effects of external factors. Astaxanthin is a natural dye that gives red feathers to flamingos and even shells of lobsters, shrimps and krill. However, its highest concentration occurs in micro-algae: Haematococcus pluvialis, from which it is obtained as a component of pharmaceuticals. Astaxanthin can also be obtained in a chemical way, but only natural, from algae, has an extremely strong antioxidant effect. protects cellular DNA by neutralizing free radicals. Astaxanthin penetrates well into the stratum corneum, accelerates its renewal, normalizes it, thereby enhancing its protective functions and reducing water loss. It also contributes to the stimulation of collagen and elastin production. Prevents photo-aging, improves skin color, smoothes and prevents micro-damage to the skin. It leaves the skin looking healthier and more rested. 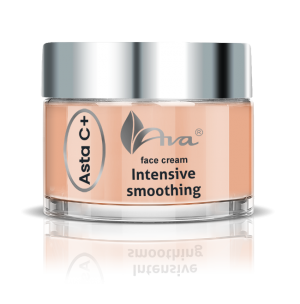 The AVA Cosmetic Laboratory has introduced an innovative series of Asta C + cosmetics, the action of which is based on the strongest natural antioxidant – astaxanthin, along with extremely stable vitamin C.
The line includes: day cream, night cream, eye cream and serum. 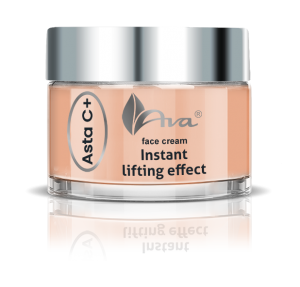 The complex Astaxanthin and vitamin C as well as Liftonin® Xpress provide immediate and long-lasting 4D lifting effect. The skin becomes smooth, firm, moisturized and elastic. The nutritional and regenerative effect of the cream is supplemented by vitamin-rich carrot extracts and red clover phytohormones. Hyaluronic acid, vitamin C and astaxanthin intensively rebuild the skin, stimulate the production of collagen, smooth wrinkles. The skin becomes firm, soft, moisturized and nourished. The complex of active substances effectively combats free radicals responsible for accelerating the aging processes and adding years of discoloration. In vivo studies of astaxanthin confirm the reduction of wrinkles, reduction swelling, restore the softness and smoothness of the delicate skin under the eyes. Together with vitamin C it rejuvenates by reducing ‘crow’s feet’, stimulating collagen production and neutralizing free radicals. The natural oils contained in the eye cream gently lubricate and provide lipid balance of the skin. As a result, it becomes firm, moisturized, effectively smoothed and regenerated. 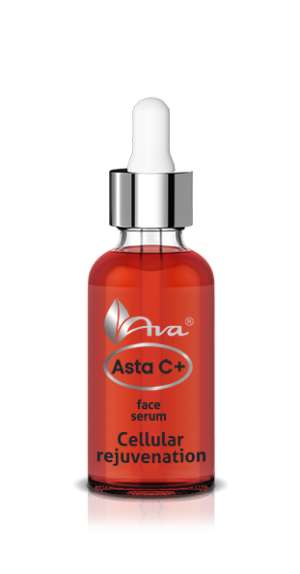 The concentrated dose of astaxanthin and vitamin C is a unique rejuvenating composition. It reduces wrinkles, improves skin tone, improves skin elasticity and smoothness. Regenerative action of the serum strengthens the extract from Indian tamarind. Rich in AHA acids, it gently exfoliates epidermal cells, regulates sebaceous glands, unlocks and cleans pores. 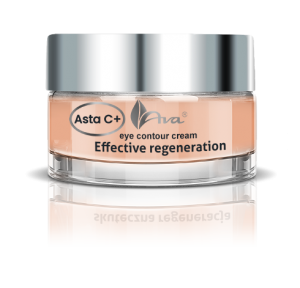 The intensive colour of Asta C + cosmetics is the result of high concentration of natural astaxanthin.